The work of the Legal Aid Commission (LAC) in the North hangs in the balance as donor funding for many of its centres runs out next month. 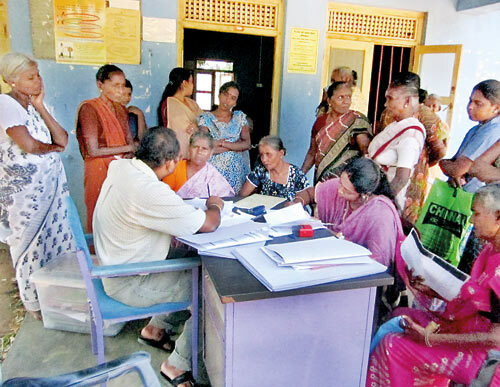 Contracted lawyers in four out of eight centres — two in Jaffna and one each in Vavuniya and Mannar –have been asked to work for an allowance until Government funds can be diverted to hire them permanently. They have not been given a guarantee of when this would happen. Beneficiaries now fear that the legal officers, who themselves have families to sustain, would leave the LAC in favour of lucrative private practice. The option of reducing the number of lawyers from two to one per centre has also been explored to match a considerably slimmer State budget. Activities in Mullaitivu and Kilinochchi, too, are in jeopardy as donor aid for those centres dries up in December. All of them have been run with European Union (EU) funding since 2012. The Commission was set up to provide free services to underprivileged Sri Lankans in recognition of the fact that qualified legal help is a constitutional right. The LAC has 76 centres countrywide. Those outside the North function with one permanent legal officer and two support staff, each. They are financed by a State-grant allocated through the Ministry of Justice but through a slim budget. For instance, the Commission was granted just around Rs. 118.8 million from Government coffers in 2013, according to its Annual Report. The District Judge said it was doubly important to have functioning, fully-fledged legal aid centres in the North as many clients were impoverished by war. They were additionally beset by a host of post-conflict social and legal problems that required courts intervention. The Northern judiciary has convened and decided to make representations to the Chief Justice in this regard. They also raised their concerns with Attorney General Yuvanjana Wijayatilake who visited Jaffna on Friday. Attempts to contact LAC Chairman Rohan Sahabandu, President’s Counsel, in his office on Friday morning failed. His secretary advised the Sunday Times to try his mobile phone. There was no answer till late in the night. There was also no response to a text message sent to alert him to our call. Uditha Egalahewa, PC, is another LAC Commissioner. He said that, to his knowledge, there had been no decision to shut down any offices. The centres in the North had been supported, not with State monies, but with donor aid because the funding agencies had stipulated as much, he said. If foreign assistance is stopped, the Government will step in — as with other centers. “The activities will continue in the entire country,” Mr. Egalahewa stressed. One complication was that the crisis has occurred midyear, when budgets were neither here nor there. But legal sources pointed out that it had long been known donor backing for the Northern centres would not last beyond the year. The LAC could have taken action well before elections were announced. And, while the Commission now maintains that funds will be obtained from the Government budget to continue operations, no firm undertaking has been given to the staff of the affected offices regarding their employment status. With the future uncertain, the Northern centres will not be able to take on new cases. Not only do legal officers represent clients in court, they offer advice as well as conduct awareness and training programmes, which include sessions for Government officials. If lawyers choose to remain on a voluntary basis — a doubtful possibility — the large numbers of aggrieved persons who flock to the offices will not be assured of their full-time presence. While the LAC has been in existence since 1978, the centers in the North started functioning effectively much later as a result of the war. Till 2010, there were only two lawyers in Jaffna and Vavuniya with two support staff, each. They did primarily private cases, taking legal aid cases as a secondary option. Between 2010 and 2012, the Norwegian Refugee Councils stepped in. But after September 2012, the LAC started its mandated programmes in the North with EU grants. The centres have handled hundreds of civil cases arising from land disputes, sexual abuse, child protection, detention and disappearances, complaints related to labour migration, etc. Legal sources in Jaffna say the work of the LAC has become even more important in the context of new social issues in the North such as a spate of rapes; extensive drug use (including among young children); impoverished villagers falling deeper and deeper into debt; and exceedingly complex land issues. There are also concerns regarding abuse at police stations, corruption in other Government institutions and labour migration that lends itself to exploitation and trafficking by agents. “If the Government is serious about reconstruction and reconciliation, they also have to take the role that legal services play in building that,” he asserted.